Conductor Bashmet says he was honored to open the newly refurbished hall.. The blue tarpaulins that have been wrapped around the Aram Khachatryan Concert Hall for almost two years were stripped away last week to reveal a clean and renovated building. Throughout Khachatryans anniversary year, the only statue in Yerevan in honor of the composer stood next to a tent hiding the debris from the reconstruction work. Only on November 22 were flowers put at the foot of his statue. The same day the long-awaited re-opening of the hall was marked with a concert dedicated to Khachatryans centenary by the Moscow Soloists Orchestra headed by world-renowned musician, violist and conductor Yuri Bashmet. The anniversary concert was the first time Bashmet has been in Armenia since 1988. Its a great honor for me to perform for the great composers anniversary. Unfortunately he didnt compose music for chamber orchestra and we cannot play his works. However, today from the heart we dedicate all the compositions we play to a giant of the centurys music, said Bashmet. Armenias First Lady, Bella Kocharyan, and numerous honored guests were present at the concert. Despite ticket prices ranging from 5,000 to 25,000 drams ($9 to $45), which were expensive for ordinary music fans, every one of the 1,600 tickets for the concert was sold. In a welcoming address, Bashmet described Armenians as very talented and creative, saying he felt a need to perform for them and visit the republic since my connections with this country are not artificial but spiritual. 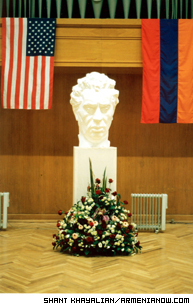 He attributed this connection to conductor David Khanjyan and composer Edward Mirzoyan. 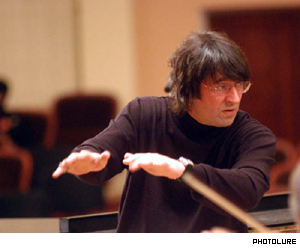 With warm feelings, Bashmet recalled that after some concerts in Yerevan in the 1990s they had to stay five extra days in Armenia because of the fog. They were taking care of me during those five days. I felt myself in Edward Mirzoyans home as in my mothers home, Bashmet said. 100 years after his birth, the composer watches over his hall. That friendship led Bashmet to record Mirzoyans symphony for string instruments and kettle drum in the United States together with the Philadelphia Symphony Orchestra. When they recorded my work, a terrible thought invaded my mind as I realized that we didnt have enough money to pay for that. Bashmet looked at me generously and said that playing my composition was more valuable than any money, recalls Mirzoyan. These days, besides his work with the Moscow Soloists Orchestra, Bashmet gives master classes in the United States, Japan and Europe. He also makes recordings in London at the BBC studios, and in Germany and France. He is an art director of the well-known Moscow December Evenings festival and founder of the leading competition for violists in Russia. During Soviet times, authorities confiscated 90 per cent of his earnings from concerts. Bashmet received seven offers to live and work in Europe during the years of changes, when many talented artists were leaving their homeland. And all members of the orchestra's 24 musicians left for Paris where they sought political asylum, taking with them even their pets. However, Bashmet returned to his homeland without his orchesta and in 1992 created the Moscow Soloists Orchestra, whose performances have lit up the best concert halls of the world and have won two Grammy Awards. He recalled 1988, the year of the Spitak earthquake, when a concert was organized in London on his initiative and sponsored by Prince Charles. Ray Charles, Stevie Wonder, Elton John and other stars took part in the event, which raised about $1 million for Armenia. But Bashmet insists that Armenians were saved not by financial aid but thanks to their talent. This country has a great future as it doesnt forget about cultural centers despite being under the pressure of social problems. Im glad that I am the first to perform in this renewed hall, said Bashmet. The new hall's look hasnt changed much, but changes in the performance quality are very noticeable. The audience noticed the refurbished stage, which was glittering under the light of new technology projectors in harmony with the music. It was planned to complete the reconstruction work of Yerevan Philharmonic Hall before Bashmets concert and conduct an official opening ceremony However, they didnt manage to be in time. The hall is ready to receive an audience, but the final re-opening will take place in the middle of December, says the director of the hall, Ruzanna Sirunyan. The roof of the building has been completely renovated, along with toilets and the make-up rooms. An air-conditioning system has also been installed. As in all the cultural centers reconstructed with funding from the Lincy Foundation, a local boiler-room has been constructed. But, like the others, the management of the concert hall also faces the unresolved problem of covering the heating expenses themselves. We hope that the problem of heating will be resolved and in winter the audience will be able to enjoy music without wearing overcoats, says Sirunyan.